I believe that fitness should be fun, challenging, and rewarding. To derive a passion for health and wellness, you have to first be able to affirm that you are working on yourself physically and mentally. As long as you try your best, you have won the day. Ryan discovered the sweet science of boxing in 2007 and has been heavily involved in boxing instruction ever since. He also loves sharing the techniques and benefits of myofascial release (commonly referred to as “foam rolling”). Health and fitness is Ryan's passion, and he looks forward to going to work every single day. 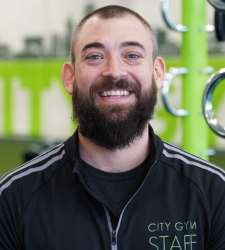 Whether you’re new to the gym and just starting to work out, you simply want to switch up your workout routine, or you’re interested in boxing, the only thing that Ryan asks of his clients, is that they have a positive attitude and a strong work ethic. With that simple combo, he's confident that he can help you reach your fitness goals.